Camping Beach Resort Solaris is a good choice for families and active adults because there is an excellent selection of activities on-site suitable for both young and old. Contact LuxCamp now to arrange your luxury camping adventure in this beautiful part of Croatia. 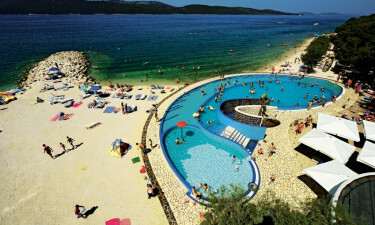 Why choose Beach Resort Solaris (near Sibenik) for a Luxury Camping Holiday? Camping luxury needs to include plenty of pampering, and this is what you will get at the Solaris Wellness Centre and Spa. The centre is divided into a number of zones including the Zen Spa Zone, Active Zone, and Comfort Zone. Some of the treatments on offer include Finnish sauna, heated pool, whirlpool, facial treatments, body massage, beauty treatments, and even chocolate and wine therapy. Just entering this wellness centre can be a relaxing experience because of the piped New Age music and relaxed atmosphere. There are different wellness packages to choose from. Please note that the Aqua Park Solaris is at extra cost! Eating at home can be a relaxing experience when you are staying in a luxury tent, bungalow tent or mobile home, but you are probably going to want to check out one of the on-site restaurants during your stay. If you are looking for a romantic or traditional Croatian night out, you can go to the Dalmatinsko Selo restaurant where you will find homemade food, live music, and a cultural show. 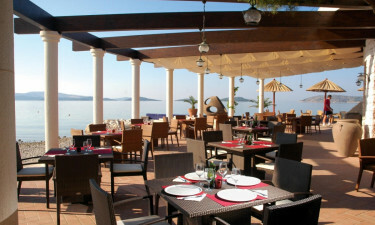 There is also Trattoria Mediterraneo which is an open-air restaurant right beside the beach that serves Mediterranean cuisine. Restaurant Sibinium is a good option if you want something fancy, and it has a large outdoor terrace. If you are looking for some nightlife, you are probably going to enjoy drinking some cocktails at the camps beach party with a live DJ. 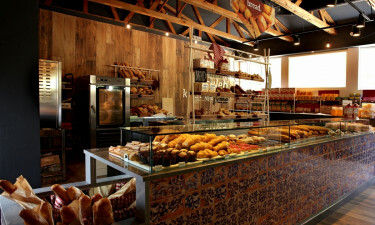 There are a few shops on-site at Solaris including a supermarket, beach equipment store, souvenir shop, snack bar, and money exchange office. You will also find plenty of shops at the nearby town of Sibenik. There are a number of kid’s play areas spread around Solaris Beach Resort, so this is an excellent luxury camping site to stay with kids. The Children’s Park has kiddie rides, trampolines, and lots of wooden structures. 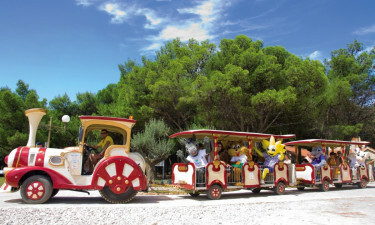 Kids also tend to love the Solaris Express train. 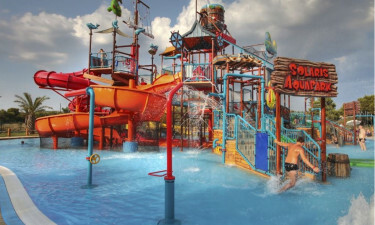 Other activities suitable for children would include miniature golf, water slides, and the sand playground.There is a kids club (+4), which will keep the children entertained in many hours. Moreover there is a teenage club for children till 15 years. The facilities at the Solaris Sport’s Centre are impressive, and if you are an active person, you are sure to find something suitable. There are also regular competitions and tournaments if you fancy adding a bit more excitement into the mix. Some of the activities you might want to try during your stay would include: five-a-side football, volleyball, cycling, or basketball.